A SIMPLE SWITCHER SOLVES A COMPLEX PROBLEM FOR THIS UNIQUE UNIVERSITY APPLICATION. 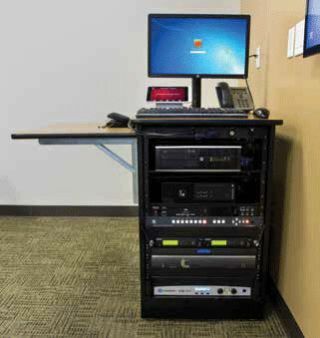 Azusa Pacific University’s innovative AV set-up includes VC & PTZ cameras. When it comes to providing quality nursing education, Azusa Pacific University (APU) proves that you don’t have to be big to achieve excellence. With a main two-campus site based in suburban Azusa, CA, plus six regional campuses throughout the state, APU’s total undergraduate student body is around 6,500. Yet this private Christian college’s nursing program—and indeed its entire curriculum—is consistently ranked as one of the nation’s very best by U.S. News & World Report, year after year. Mindful of the cost-effectiveness, convenience, and teaching quality offered by videoconferencing (VC), APU has been testing a scalable, multi-camera VC system for use initially by nursing faculty and staff, with the goal of expanding into the classroom. “This supports our overall Video Collaboration Strategy and Vision that ‘IMT will enable the APU community to collaborate with anyone, wherever they are, with any device they choose’,” said Vivanco. The APU VC trial links the Azusa West Campus’ conference room (origination) with a satellite lecture hall in its Monrovia location. The two sites are connected via the high-resolution Vidyo professional VC platform in parallel with lower-resolution consumer Internet-based options such as Google Hangouts. If the test system works as expected, it will serve as the model for larger scale roll-outs throughout all of APU. Being able to use VC-equipped classrooms would definitely reduce travel time for students and teachers alike, and let one instructor teach in many locations at the same time. Clearly, APU’s multi-camera feed issues needed to be addressed. To do so, db Media Group turned to Marshall Electronics, one of its key equipment suppliers. In turn, Marshall Electronics offered up its $1,300 VSW-2200, a simple yet seamless four source HD-SDI audio/video switcher. An iPad mini provides the control interface. Promoted as a “small studio video presentation switcher,” the VSW-2200 AV switcher can switch seamlessly between four 3G/HD/HD-SDI formatted feeds. Its HDMI/SDI outputs provide re-clocking and equalization, thus ensuring that the outgoing signal will not experience sync issues when it encounters a VC codec. As well, the VSW-2200 can output its four feeds in Quad view via a separate HDMI output port, and also has ports for Ethernet and mini-USB. The unit can be switched using its four front panel source buttons, or over an IP network using Ethernet-connected devices (both wired and wireless). Theoretically, the APU conference room instructor could control the VSW-2200 directly, going from camera to camera by pushing buttons on the unit’s front panel. However, mindful that instructors don’t like to remain pinned down in one place, db Media has integrated control of the VSW 2200’s functions (and the whole system) to a wireless iPad Mini. Azusa Pacific University hopes to extend its VC system throughout its many campuses. The instructor simply picks up the iPad Mini at the start of class, and keeps it with them during the sessions to do camera switches as needed. They can also use the iPad Mini interface to live-control each room’s PTZ cameras, supporting zoom-ins and rotations as required to get each speaker clearly into the center of the screen. “We have configured a number of camera presets into the iPad Mini’s program, so that a room can be set up for a specific coverage configuration at the touch of the screen,” said Burdett. Based on the results that this test deployment is achieving, it is likely that Azusa Pacific University will extend its VC system throughout its many campuses, and the VSW-2200 switcher will play a part in it. James Careless is an Ottawa-based technology writer and regular contributor to AV Technology.